Did you read about my conversations with John Lennon? If you missed it, start reading here on the Soulful Traveler blog. As we end this year and transition into the next, let us reflect on our journey, as we let go of the all the pain of the year we leave behind. For many of us, grief marked our 2015. When I channel messages from Spirit, there is a lot more going on a multi-layered dimensional way than just the simple words I write down, as I record the experience. Some things just don’t translate into words at all. It resembles more like dream language that we have when we’re sleeping, where a wave of experience can flow through your mind and heart. Whenever I channel messages from Spirit, I will sometimes sift back again through all the data that came through to me, because sometimes there is even more to learn the second, third, fourth and even many more times, from the experience. This is why I was still studying the material from my conversations with John Lennon. It was many days later, when I was re-reading my notes, when I realized that John talked about bombs and peace AT THAT PARTICULAR MOMENT IN TIME to give us hope and literally share LIGHT with our world, that had been reeling from the terrorist attacks in Paris, and then Mali. John knew we would be hurting from these attacks on our planet and he gave us a beacon of light to turn to, with his words to me, in all that darkness. Another thing that happens when Mediums channel messages from Spirit, is that even when we are channeling a message for someone else, there is always something that we ourselves can learn from each experience on a personal level. There are no coincidences, but true divine synchronicity at work, about our getting these personal messages meant for us. It always happens at a time when we really NEED that information and helpful for our own healing journey. Every Medium has their own healing journey with grief to deal with, with our own dearly departed loved ones that we are missing. Yes, we can connect through Spirit. But it’s just not the same as having those loved ones in our physical world, there to turn to whenever we want. For me, I have had my very personal healing journey with grief, with the loss of my beloved mother years ago, and my beloved sister, more recently. Time is relative when it comes to grief. Although my sister transitioned back in 2013, for me it often feels like yesterday. And I have been really struggling with that grief I felt over the loss of my sister, and also the loss of my mother. Well, John Lennon’s conversations with me held a key to my healing with both my mom and sister. He gave me a few healing keys that helped me to connect to my mother and sister in heaven. What happened between me, my mom & sister was a miracle. It was a moment that literally changed my life and changed my view on life and death. And my answer to them was, yes you can. John Lennon showed me the way how, and shared the crucial keys that I needed, in order to be able to reach out to my loved ones in heaven. And I am sharing them with you too, here. Recently, I had an extraordinary moment when reading an extraordinary book, called “Dying To Be Me”, by Anita Moorjani. Anita Moorjani wrote about the near death experience she had, when her body had shut down from cancer. She gave a very vivid narrative about leaving her body and going into the Light, where she experienced the very fullness of heaven. Her story about witnessing heaven was so incredibly filled with light, that Dr. Wayne Dyer, as he mentions in his foreword to her book, felt he had to make sure her story became turned into a book so that the whole world could read it. He wrote about how everyone who read her incredible story had their whole outlook on life change. And he did indeed speak the truth. When I read her very vivid encounter in heaven, suddenly I found my spirit lifted up to heaven too. I was not dreaming or asleep. I was wide awake and suddenly I was JUST THERE – IN HEAVEN. I saw my beloved sister, all dressed in white, smiling as she walked towards me. She looked pretty much like she did at the end of her life. Beautiful and elegant. And then, there was my beloved mother, also smiling as she walked up to us. First, my mom looked like she also did at the end of her life, an elderly lady in her 70s. And suddenly she transformed into her younger self, an image I remember from when I was very young indeed. She looked to be in her 40s – even younger than I am today. She had long hair up in a pretty updo that I remembered from my childhood and old photos. And then my beloved sister and beloved mother hugged me at the same time. We stood there in a three-way hug for one glorious, never-ending, heart-breakingly BEAUTIFUL moment. As we hugged, every fiber of my being FELT how happy my mom & sister were in heaven, how happy they were to see & feel ME. And we were surrounded by the MOST INCREDIBLE WHITE LIGHT. The Light of Heaven itself. In that light, was ALL THE LOVE IN THE UNIVERSE. Imagine all the love you have ever felt in your life – and then multiply it by A MILLION TIMES. I found myself sobbing uncontrollably for what felt like hours because my HEART had just been just been BROKEN WIDE OPEN BY JOY. I have never felt my heart break from joy before. I just felt the pure waves of LOVE pouring over me, my mother & sister, as I cried my heart out over and over and over again. And with that gigantic wave of love hitting me over and over and over again, I felt every single little bit of sadness that had been part of my grief, for both my sister and mother, completely leave me. The grief was just gone. And in its place, was the most profoundly deep sense of total PEACE. I now KNEW, not just intellectually with my brain, but I KNEW with all my heart, that my mom & sister were happy and OK. I FELT the glorious magnificence of their happiness. And I KNEW, that I would see them again one day. It took me quite awhile to come back to earth again. I was wiped out for a couple of days by all that I had felt. The human body is not meant to contain that much joy. That is why souls exist in a pure energy form in heaven. I was stunned, spun, and rung out. But I felt so much peace inside that has not left me since. It is possible to visit your loved ones in heaven. It is possible to hug your loved ones in heaven and really feel it. There is a special meaning for roses, and it’s not what you first think it is. 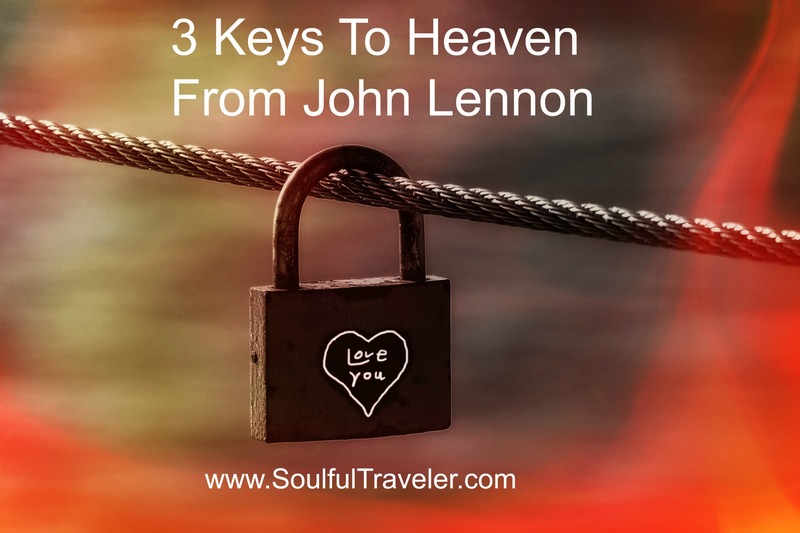 When I finally came back to my senses and went back to every day life, I realized that John Lennon had given me the keys to do that, to be with my loved ones in heaven, and to feel them. And to be able to receive a priceless gift from them – a missing piece of my own soul, that was reunited with myself again. How was I able to visit my loved ones in heaven? Lots of people have asked me that question, when I shared pieces of my visit to heaven with them. I was able to visit heaven because I was able to raise my vibration high enough, that matched the frequency of heaven. There are many techniques in the Universe that can teach you how to do it. For me, it was because John Lennon had come to me and showed me glimpses of heaven, when I asked him what he and other people he hung out with in heaven, were doing in heaven. I was able to do it because I had already done it – without realizing I had actually been lifted up to heaven, with John’s help, while I had talked to him! This reminds me of the scene in the movie Harry Potter and The Chamber of Secrets, when Harry Potter was first able to summon a Patronus to fight off the evil soul-sucking Dementors. He was able to do it, because he had seen his time-traveling self do it – so knew he could do it. That’s how I felt, without having to use a magic wand in the process. And that was when I realized that John Lennon had given me a priceless gift. The ability to enter heaven, and learn & feel for myself that my loved ones were happy. You don’t need to enter heaven to talk to your loved ones. Any time you talk to them out loud or in your head, your loved ones are instantly with you. They are just right there. And anyone can do that. You don’t even have to be a Medium. But if you wanted to get a glimpse of heaven too, like I did, you can use whatever method that works for you, to raise your own vibration, and enter heaven as well. But your intent must hold only the purest of love. Any selfish intent just brings your vibration right back down. Try raising your own vibrations and see what happens! When I had my second conversation with John Lennon, I had asked him what else he had learned while he’s been on the Other Side. That was when he came over and gave me a hug. It was personal. It was meant for me. And it was even more of a precious gift then I realized at the time. Because I FELT it, felt his hug. And when I had my mother & sister walk up to me in heaven a week later, a part of me KNEW that I could hug them – and FEEL that hug. Because John had shown me the way. I will always treasure that gift all my life. That hug from John Lennon was also meant for YOU, and the world, reading this. In my sharing this hug from John with the world, I am letting you know that it IS possible to hug people in heaven. It IS possible to FEEL your loved ones in heaven. My story about my mother & sister showed me that it is possible to reach out and feel them – just open your heart to the experience. BELIEVE you can. BELIEVE it’s possible. You won’t know until you try. Learn from those who have done it before. Imagine you are hugging your beloved loved one. See it in your mind. Feel it in your heart. And if you keep trying, you may succeed in actually FEELING them and FEELING how happy they are, and how free they are, in their new light energy bodies. It is so very WORTH IT! John Lennon gave me one more precious gift. It was a simple white rose that he showed me, in the second conversation I had with him. Now here is something you didn’t know about me. Roses have been my least favorite flowers for decades. In fact, I hated the sight of them for the longest time. You see a long time ago, I suffered the unwanted advances from a man who wouldn’t take no for an answer. A stranger he was – not someone I dated. It was someone I wanted nothing to do with. And he kept sending me dozens and dozens of long-stemmed red roses. And the sight of them eventually just made me nauseous. I wanted nothing to do with them or him. When John Lennon showed me that white rose, he knew all about my history with roses. But he chose that one object for good reason. And I knew he wanted me to go look into that, and see WHY he wanted to share that with me. So I went and did some research on white roses, and discovered that they were the flower for remembrance and honouring the dead. John showed me that white rose on Remembrance Day, and so that totally fit. But little did I know that there was much, much more to this white rose story. When I hugged my sister and mother in heaven, my mom shared something special with me, to take back with me when I went back to earth. She showed me red roses with a smile. Red Roses! Suddenly I remembered something I had forgotten for years. And my mom gave me the clue to finally solve a mystery that had haunted me all my life. One of my earliest childhood memories was an image in my head, of when I was a teeny tiny tot, of my mother singing a particular song in Italian. I remembered her singing as she worked around the house and I got such a sense of happiness from her in that memory. My mom happy when I was a child! That was a rare memory for me. I have very few memories that I remember from my childhood. That memory of my mom singing would not let me go through the years. I would pester my mom, many years into my adulthood, to have her tell me about that song and why she sang it. In the end, she just got fed up with me and said she never remembered singing at all during my childhood. Period. But that happy memory would not let me go. And suddenly in heaven, my mom gave me back that song, with love and joy. That fragment she gave back to me was enough and my mom gave me a gentle nudge to go look it up when I came back to earth. AND I FOUND IT! I FOUND THAT JOYFUL SONG AGAIN! It was a piece of my childhood, given back to me with love. It was a very piece of my own soul – reunited with the rest of me. I found the song with seconds, thanks to Google. And there was the video. I looked at the time frame when the song was released. It fit. I was about two years old when that song was popular! And my two year self never gave up the ghost. My tiny baby self got that love back from my mother. So I cried – again. That was the true reason why John Lennon showed me a rose. It helped me get that piece of roses back from my mom. It helped me to finally and completely heal, from that horrid association with roses. Roses now had a NEW BRIGHT connection for me. Red roses now belonged to me and my mom alone. And no one and nothing will ever take that away from me again. I was healed. I was whole. I was at peace. I was blessed. And maybe you too, can connect with some thing you once loved, some object, in a whole new way again. Especially when it belongs to your loved ones on the Other Side. Recently, I had shared with different people that I had visited heaven and was still recovering from my experience. Many grieving people told me that they wished they could visit their loved ones in heaven too. I hope that every person who is missing their dearly departed loved ones, and reading this article, may find some healing tools here that help you too, have a healing heavenly visit with the ones you love. P.S. Wish you could get a message from your dearly departed loved ones, or from the angels and spirit guides that always watch over you? You can get such healing messages from booking a channeling session with me, through my Services today. Aurora North is a Writer, Medium, and Soulful Facilitator who, through spiritual coaching, helps people unlock their soulful potential. She channels messages from Spirit (angels, spirit guides, Earth-bound spirits, departed loved ones & other light beings) which provide healing and growth along the spiritual path. She has also been giving tarot and oracle card readings since she first picked up a deck 20 years ago. To book a session with Aurora, please choose from the Menu of Services or send her a message.